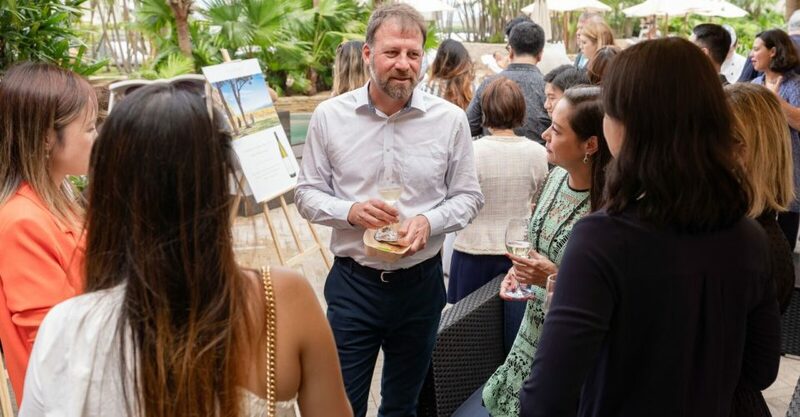 Jim White at a Cloudy Bay event in Hong Kong. Jim White’s career in wine was sparked when he tasted the 1994 Michelton Cabernet Sauvignon as a student at agricultural and viticulture student at Melbourne University. Jim joined New Zealand’s Cloudy Bay winery in 2011, and became the Technical Director this year. Jim was in town recently to launch the brand’s 2018 Sauvignon Blanc, and we caught up with him to talk all things wine and New Zealand. What sets Cloudy Bay’s Sauvignon Blanc apart from other New Zealand Sauvignon Blancs? Cloudy Bay Sauvignon Blanc is the wine that put New Zealand wine on the map. It has always been the quality benchmark for New Zealand wine and continues to be that today. The combination of lifted aromatics and a palate of weight and elegance sets Cloudy Bay Sauvignon Blanc apart. What will Hong Kongers find particularly appealing about the new Cloudy Bay Sauvignon Blanc? 2018 delivered a wine of enticing and complex nose of passionfruit, lime and peach, in the mouth those flavours explode on the tongue filling the mouth and ending with a vibrant fresh acid finish. Tell us a bit about the terroir and production process? [Editor’s note: Cloudy Bay’s Sauvignon Blanc vineyards are located in the Wairau Valley in Marlborough, and feature stony soils.] We maintain low yields to deliver concentrated flavor in the wine. The winemaking process aims to preserve and enhance the fresh, fruit driven flavors.. Mostly fermented in stainless steel tanks, a small percentage is fermented in barrel to help develop richer textures in the mouth. If you could design an ideal visit to the Cloudy Bay winery, what would it look like? We would start in the vineyards, getting and understanding of the climate, soils and vines that make our wines so distinctive, then head back to the winery to learn about the winemaking process. Finally, we’d taste the range of Cloudy Bay wines on our terrace with the mountain range which is depicted on our label in the background. With our cellar doors in both Marlborough and now Central Otago also, we provide this opportunity for the public every day of the year. What foods pair best with the Cloudy Bay Sauvignon Blanc 2018? I love fresh, simply prepared seafood. For example, natural oysters with a squeeze of lemon, scallop ceviche, sashimi or sushi. What are your personal favourites from Cloudy Bay/ the Cloudy Bay archives? I am lucky to have tasted nearly every wine made at Cloudy Bay since the first vintage in 1985. Some of the old Sauvignon Blancs from some warm years such as 1991, 1998 taste amazing complex and very fresh, but for me the 2001 Chardonnay, my first vintage at Cloudy Bay, is a perennial favourite of mine. Why do you think New Zealand Sauvignon Blancs are so popular? It’s delicious, lifted aromatics, fresh acidity and easy for consumers to understand. They are wines that you can simply just drink and require little though, but if you choose to, you can think about and analyze them also. Want to see more interviews with cool people visiting Hong Kong? See our Travel Talk profiles for more!